O'Neill Wetsuits, one of the pioneers in cold water wetsuits has released the newest, lightest, and most flexible wetsuit to ever enter a surf shop. This makes us excited. 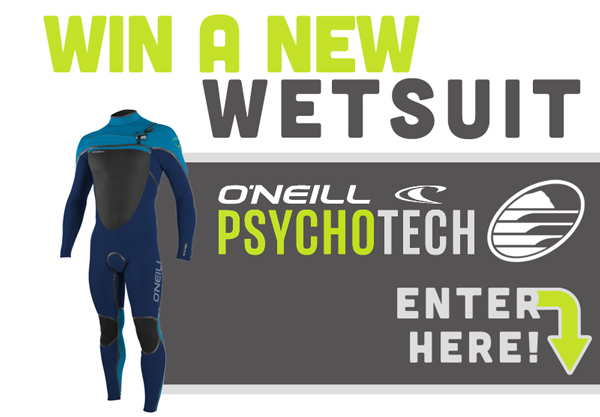 We're so excited that we are giving away the Psycho Tech wetsuit of your choice to kick it off. “The O'Neill Psycho Tech 5.5/4 Hooded Wetsuit is the new generation of our shop favorite, the Pyrotech. This premium coldwater suit has the warmth, flexibility and durability you want in a wetsuit and is constructed with high quality materials from one of the greatest innovators in the industry. Made from 100% TB2 Neoprene, the PsychoTech is super stretchy, lightweight, soft and pliable. TB2 truly is a step ahead of the game when it comes to quality neoprene. It is the most advanced super stretch neoprene available on the market. 20% lighter, 30% less water absorption, with improved durability and quick dry properties, you just can't beat it.